Hanukkah, as we all know, is a Jewish holiday celebrating the rededication of the Holy temple in the 2nd century. It is an eight-day celebration commencing from the 25th day of Kislev in accordance with the Hebrew calendar. This year Hanukkah would be celebrated beginning from 8th of December 2012 through 16th of December 2012. When we think of celebrating the holiday, the main things that come to our mind are Menorah, Star of David and the color blue. You can raise the spirit of celebration by setting up a surrounding exactly according to the theme of the event. Costumes for Hanukkah celebration would include those of Rabbi. You can find variants of these costumes in terms of style and sizes. 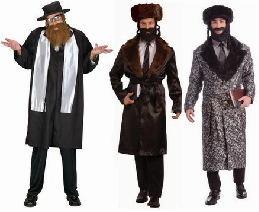 The choices lie among a simple Rabbi Adult Costume, a stylish Rabbi Adult Costume and a Rabbi Deluxe Adult Costume. If you just wish to put on a hat for Hanukkah and let the rest remain simple, then you can pick out a hat of your choice from the options that we have on our site. 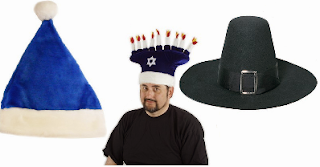 These would include Happy Hanukkah Hat, candelabrum Happy Hanukkah Hat and Puritan Hat Adult. To get you kid dressed up for the Hanukkah celebrations, you can pair up a blue t-shirt with blue tights and get one of the hats above mentioned to get the entire look. Get ready for the Hanukkah celebrations with all the necessary party supplies in hand. To suit your needs and desire, you have many options available with you. You may want to go in for a Festive Hanukah Party Pack. The standard pack for 8 includes: 8 dinner plates, dessert plates, cups, forks, knives, spoons, 16 napkins, and 1 solid-color table cover. The standard pack for 16 includes: 16 dinner plates, dessert plates, cups, forks, knives, spoons, 32 napkins, and 1 solid-color table cover. 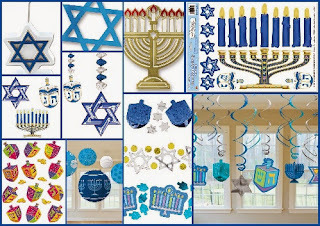 You can get the Hanukkah special party supplies by ordering all the required things in the desired quantity separately. 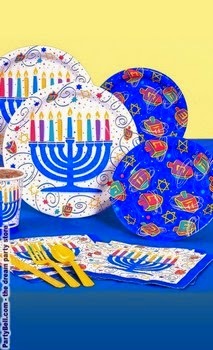 This may include Festive Hanukkah Dinner Plates, Festive Hanukkah Dessert Plates, Hanukkah Playful Menorah 9 oz. Paper Cups, Hanukkah Playful Menorah - Lunch Napkins and Festive Hanukkah - Beverage Napkins. To keep everything simple, you can just go in for everything blue. 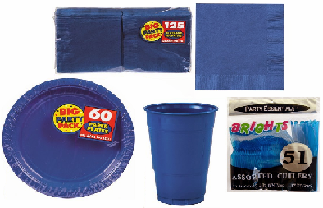 Get a True Blue Standard Party Pack which is a standard pack for 24 and includes: 24 dinner plates, dessert plates, cups, forks, spoons, knives, 50 lunch napkins, solid-color table cover, 12 latex balloons (1 color), 1 curling ribbon (1 color) and 1 crepe paper roll (1 color). Gathering all blue party supplies separately on the basis of requirements is another good idea to set in for the Hanukkah party. You can go in for Bright Royal Blue Big Party Pack Dinner Plates, Bright Royal Blue Big Party Pack Dessert Plates, True Blue 16 oz. Plastic Cups, True Blue Lunch Napkins, Bright Royal Blue Big Party Pack - Beverage Napkins and Neon Blue Plastic Cutlery. For additional party requirements, you can opt for Festive Hanukkah Table cover and Hanukkah Favor Set too. A celebration without the decorations seems incomplete. 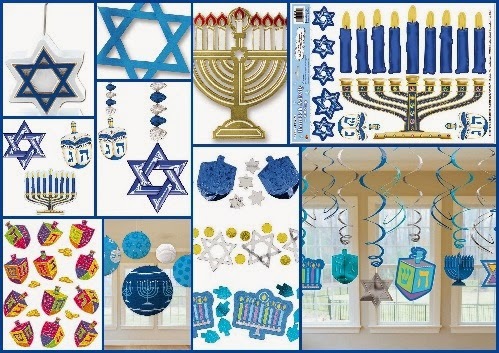 There are many things that you might want to include in your decorations for the Hanukkah party. The following things can be helpful while you are up with the preparations: Hanukkah Foil Star of David, Hanukkah Confetti, Hanukkah Cutouts, Hanukkah Foil Menorah Silhouette, Hanukkah Activity Peel 'N Place, Star of David Photo / Balloon Holder, Hanukkah Round Paper Lanterns, Hanukkah Hanging Swirl Decorations, Hanukkah Dreidel Stickers and Hanukkah Danglers. Hanukkah is the festival of lights, so let the joy of the celebrations pour out with all the party preparations in place. Right from the costumes to the supplies and decoration, let everything be elegant in appearance. Happy Hanukkah to all our readers!